I am hearing no discussion of the potential pro-life US Supreme Court as a result of this election. The concern has switched exclusively to the immigration issue. President Trump put his hand on (2) Bibles and took an oath to protect and defend this country (the president can do this as he and his best advisers see fit as long as they do not break laws in the process.) The US President runs this area (immigration and refugees) and his job is very different from The Church Leaders in this way. I realize that as a personal matter, we are all called to “…welcome the stranger…” He is charged with protection of the country against foreign and domestic threats – FIRST, before anything else. How he does this (within his purview) – God will judge this – the job is too big and unique to approach what the policies should be as a personal behavior. Well said, but some untended consequence. Perhaps instead of what the Archbishop says, ,many were allowed into USA not because cheap but because compassionate. The Irish, the Jew, the Italian, etc. we’re all routinely paid cheaply but paid. No,education, no skills, labor alone, and honesty. Most times take advantage of their own kind. I would ask that intentions not be assigned but compassionate solutions,applied. I for one am disappointed that folks leave home, and family behind,to,escape injustice. Their loved ones are left in injustice for ? $. It is one thing to not have food, quite another To find cruelty and injustice. that is eveywhere but Justice as Scripture says is what Peace kisses. Global corporations, rootless laborers, disrupted communities, workers in ruthless competition for low paying jobs– since when has the Church been in favor of unfettered capitalism? 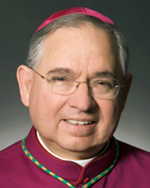 Archbishop Gomez has given a masterful address on the personal and moral aspects of this latest deportation of undocumented immigrants from our country. His presentation of the “human face” of immigration as well as the fair and balanced way that he discusses all sides of the issue lends credibility to his appeal for mercy. In my opinion, the latest order by the DHS is cruel, and in many cases indiscriminate and disregarding of human rights. The way that it is being implemented is bound to get out of control. Ret. Gen. John F. Kelly, Secretary of Homeland Security, was seen to make the sign of the cross after having been sworn in. In addition, he is a parent whose son was killed in Afghanistan. I find it hard to believe that he can be considering such things as separating mothers from their children in detention centers as a deterrent. It seems to me that he is overseeing the Department of Homeland Security as if he were still a general in the battlefield. (He has only been retired from the military since Jan 2016.) He is allowing local police to be trained as ICE agents and is hiring 10.000 more ICE agents. What kind of “extreme vetting” will these people get to weed out those who are prejudiced and prone to abusive behavior? I am grateful to Archbishop Gomez for his pastoral approach to this issue made more poignant considering the fact that he shares a heritage with many of the people who are facing deportation. He has given me hope that I too can deal with this issue with sensitivity, compassion and the right kind of action. It should not be forgotten that the influx of undocumented laborers has been caused by US companies — from large agricultural corporations to small farms and businesses — that have a need for low, below legal, wages. The need for such laborers has been abetted by the conscious lack of enforcement of immigration laws by the Immigration Services. And “now” we have a problem, for if they become citizens, their employers would have to abide by all the legal protections afforded by US laws. Which they could not do and stay solvent. I agree with you wholeheartedly. Just today, when I was talking about the Cuban immigrants stuck in Central America and how they are not being received in the USA even though Trump promised to work with Cubans to whom he owed the votes here in Florida a woman yelled saying that illegal immigrants should not be allowed. Yet these people come with their papers and they sold what they had in Cuba to come over here with their families, just to be sent back by those governments and our government looking the other way. I hate to see families broken up by lack of mercy and acceptance. I hate to see young people with no future and adults living in fear and being exploited by those who feel they are superior. I have a poster in my dining room of a boat filled to the brim with immigrants. I pray every day for them since I too am a Cuban immigrant who came to this country with only five dollars that I was allowed to bring in 1960. Can someone please explain to me why we are rewarding people who are breaking the law? My grandparents and father came to this country legally. They had to learn the language. They were not given English is a Second Language for free. They want to simulate into their new country, not just wanting all of the benefits. Please note that Archbishop Gemez said my people. The people of the U.S. are now your people, not people who are here as illegals. Thaank you for sharing Bishop Gomez’s speech. I had read about it, but reading the full speech was powerful. 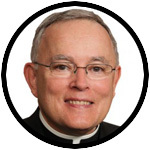 Archbishop Gomez, as Archbishop Chaput stated, gave a “most compelling and sensible” talk about immigration problems that are being faced in our country. It was a straightforward account of what took place in this country before any white settler ever stepped foot on its soil. An account that clearly describes the role of the people who lived, worked and died to make this country great. Immigrants. They came in all colors from most every corner of the world to help shape this country become the land of opportunity, giving hope to those who had very little. Religious persecution, famines, political unrest, deceit, avarice and much more were some of the reasons that people immigrated to what became a unified country. Unified by people of all races, beliefs, poor, rich, educated and non-educated, alike. The leaders of this country will destroy it from within if they continue to lead from a standpoint of gain through politics. Why is it that mostly the rich tend to enter politics? For monetary gain? They already have much more than they need. No, it must be for power, power to keep people of the lower classes in place. Oh yes, in this land of opportunity people can make a lot of money (think entrepreneurs, athletes, drug dealers, etc. ), but the super rich have a way of keeping all people “in their place”. Their lust for the dollar provides them with a power that has become evil in nature. Change is constant and the change we are currently experiencing is not for the good of our country and its people. We are “one nation under God” and only God will make America great again. That’s a great talk from Bishop Gomez, whose wages and quality of life were not affected by the influx of “Immigrantes sin papeles” these last 3 decades. illegal immigrants from Asia to Latin America to Africa are here for only one thing: cash money. They readily find employment with unscrupulous Americans in our service sector. As landscapers, domestic help, restaurants, construction, meat and fish processing, farm labor, etc. What they bring are low skills, language and health problems AND the attitude that they may continue to circumvent our laws, and will continue to do so indefinitely. They have learned to reflect the attitude of various employers that they are disposable, and thus have disrupted our entry level job market for legal residents of this country. Gomez suggests that Latinos are wonderfully Catholic, and will bolster the Church somehow. Here in the Philadelphia Archdiocese, the very small percentage of recent Latino immigrants who express their faith have asked for and gotten their own, separate parishes subsidized by the rest of us. Why, if not that they would rather avoid our regular parishes? that Bishop Gomez would soften for the immigrants. Any one of which would cost me fines and/or jail time as a legal resident of this country. Justice is hardly the name for this kind of thinking, as it ignores the workers already in the vineyard at sunup. Please don’t quote me Matthew 20. The original workers were not made to pay health and child care costs, legal fees or other subsidies for the workers who came late to that vineyard. The one day in that parable has stretched over a generation and suppressed wages for anyone entering that job market now. I have also seen the eyes of immigrants, and some of them are furtive. You must not imagine every single “story” is valid. Many undocumented immigrants do pay taxes. Pretty typical to conflate illegal immigration with legal immigration. Illegal immigrants enter this country, knowing they are committing a crime. Thanks They have made a choice to break the law, and when you choose to break the law, you suffer the consequences. How is that the human rights test of this generation? Where is the concern for the millions of babies who are murdered in their mother’s womb. Abortion is the very definition of a heinous crime committed on society’s most innocent and vulnerable. This is the human rights test of our time! Where is the Archbishop defending these poor babies? Is he, like the majority of priests who only shout about what is politically correct! Where is your courage! This is why Catholics are leaving the faith. The hypocricty is staggering! Also, isn’t it interesting that the catholic church is one of the largest recipient of financial “donations” in the world? If the pope is so concerned for these migrants, then why doesn’t he exhort those countries (including his native Argentina) to take care of their citizens in need? I just want to thank you for put it on a powerful and true story told by a person with enough experience and wisdom which is our Bishop Jose H Gómez, I encourage you to share this very inspirational talk that give us a tremendous hope to all parishes in USA. As he say right, every immigrant have his own story to tell and all and everyone are human being with Soul and dignity not matter what race, nationality or beliefs. We are one body in Christ and all have one and only one Creator, God. Hope you spread this message to create conscious all over the country and make a great and blessed nation!